We are all impressed with the price and specs of Cherry Mobile’s first 7 inches quad core tablet called Fusion Bolt. Recalling all the goods of Fusion Bolt, it is loaded with the latest Android Jellybean OS, equipped with 1GB RAM and a 1GHz quad core processor. 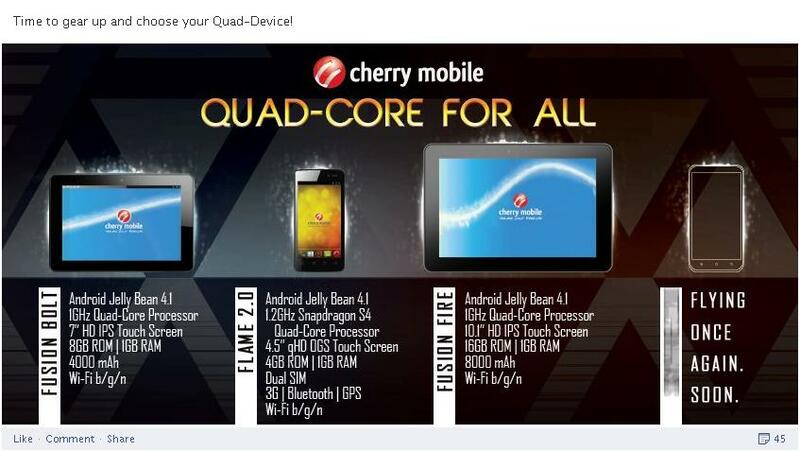 The fusion never stops as Cherry Mobile revealed their latest 10 inches quad core tablet named Fusion Fire. We saw it on their Facebook page after they posted a teaser photo of upcoming quad core phone. We have no idea yet about the pricing of Fusion Fire but expect its price range fall at 6000 to 8000 pesos. Its runs on Android 4.1 Jelly bean OS, 1GHz quad core processor, 1GB RAM, Wifi capable and 8000mAh battery. 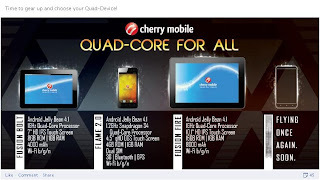 Cherry Mobile Fusion Fire is part of Quad core for all banner together with Fusion Bolt tablet, Flame 2.0 and the new one which is coming soon. It is another Android phone to be added on their lineup of affordable quad-core phone. We’ll just wait for Cherry Mobile to officially announce the complete specs, availability, SRP and other details about this tablet.